Vedic Astrology is a beautiful, ancient science of self-discovery which teaches us how life works, how we fit into the bigger picture, our purpose for being here, and the goal of our lives. This study and practice enriches our own life and enables us to help other people enrich theirs, giving guidance in all matters of life, from career to love to health. As a teacher of Yoga and Ayurveda, I am amazed at the profound perspectives offered by understanding this often complex, yet always inspiring science. I traveled all over to study with many Western and Indian teachers before meeting an Indian Guru who was able to answer any question I asked about this science. Sitting in classes with his advanced students literally made my head spin; sometimes I had to hold onto the seat of my chair. The way my brain processed information or viewed reality shifted — it was a change in my own consciousness from knowing that everything in the universe is connected to understanding how it is all connected. 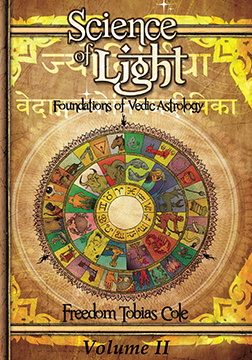 This book lays a firm foundation to expand the awareness toward the higher teachings of Vedic astrology. Many books aim to help a person read their chart and the charts of others; that important component is also taught in this book, but a deeper layer of astrological information is also presented here. It is by setting a proper foundation that the fully empowered flower of intuition will bloom. A technical understanding forms the roots, and it is the strength of the roots that show the might of the tree. I have spent the last few years researching more advanced topics in Vedic Astrology, but have felt the lack of the proper foundations limiting the audience of such research. 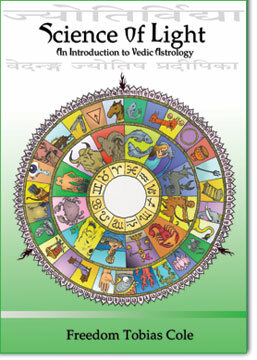 This book attempts to create an honest, well-rounded understanding of Vedic astrological principles. I plan to follow this up with two more books, completing the full set of tools a person will need to have a holistic approach and comprehension as a qualified Vedic Astrologer. This book is Vedic Astrology 101. Each chapter here could be a whole book in and of itself, but my goal is to make sure a person has the overall view of the field of this science. I offer this book for students of Vedic Astrology to find the gems without wandering around for years looking for the mines. I have used the ancient text of Maharshi Parashara, the grandfather of Indian astrology, as a basis for this book. His text is a gold mine with endless gems, and this book elucidates the secrets found therein. The systematic study of the present text will open the doorway to the ancient science of light.